We are certified to deal with complaints by consumers against businesses through the EU Online Platform that all UK businesses are required to signpost to on their websites even if they don’t want to use ADR. This leads to confusion for consumers. Sadly that does not seem likely to change in the near future and businesses are missing out on the chance to save costs by mediating. We are informed that over 5000 complaints have been submitted to the platform since 15 February which are at different stages of the procedure. As far as the UK is concerned, around 1,300 complaints have been submitted by UK consumers against EU traders (among which close to 90% against UK traders). 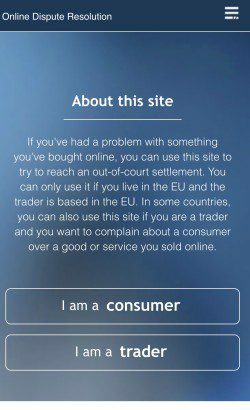 In total a bit more than 1,400 complaints have been submitted by EU consumers (including UK consumers) against UK traders. What is unclear is how many traders have agreed to follow the procedure or resolved their complaints through the platform. When looking at these figures however, one has to take account of the fact that we are still at an early stage and that not all Member States have notified ADR entities for all sectors. The EU Commission is closely working with them to reach a full coverage as soon as possible. 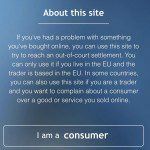 A further element to bear in mind is that the platform still needs to be better known by consumers and traders in the EU. The Commission therefore plans to launch some communication activities starting this summer, when they are expecting that the platform’s coverage in terms of sectors is more complete. These communication activities will focus on social and online media and complement efforts undertaken by national authorities. They will target both consumers and traders. Online traders will in particular be reminded of their obligation to provide a link to the platform and receive information on the benefits that engaging into ADR to resolve contractual disputes entails for them. The EU intends to publish statistics on the use of the ODR platform later this year, once they have more meaningful data over a longer period of time. The Directive on consumer Alternative Dispute Resolution does not prescribe the nature of the ADR procedures to be implemented in Member States, and notably whether the trader participation in the ADR procedure should be mandatory or not. This is a decision to be taken by each Member State. On the possible future amendment of the Directive, the EU considers that it is important to have enough hindsight on its implementation before drawing any conclusions. The Commission is however closely monitoring the implementation of the Directive in all Member States and they will regularly report (in 2019 for the first time) on the Directive’s application. The report will build on national reports on the development and functioning of ADR entities in Member States that national authorities must provide every four years. The Commission may consider the advisability of proposing an amendment of the Directive in the framework of this regular review exercise. In short, this means no change until 2019 at the earliest. We await further statistics with interest as in our experience traders remain to be convinced about the merits of ADR, although there are several who retain us to deal with disputes by way of voluntary mediation as opposed to ombudsmen and recognise the cost benefits.